Max Occupancy: 4 Standard Double has 2 Full size beds and sleeps up to 4 persons. 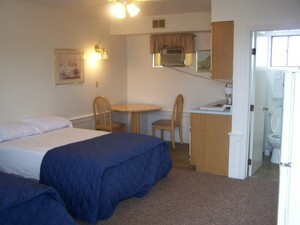 A/C, Ceiling fan, Full Bath/Shower, Closet, Full size Fridge Microwave and Coffee Maker. The Kitchenette is a counter, sink, cupboards and a sitting table. Perfect for sandwiches and microwaveable's. We do not provide utensils or dishware. Thank you for staying at the Nautical, we appreciate your business!